Pro Tools & Equipment, Inc. 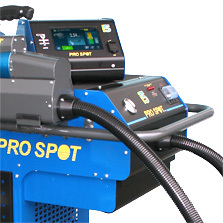 Pro Spot International, Inc. is proud to announce the launch of its new SMART spot welder. The i5 features a new medium frequency trans-gun capable of delivering over 13,000A with over 1,000 lbs (450dAN) of squeeze pressure. The i5 is designed to handle all new ultra high strength steels including Boron, etc. 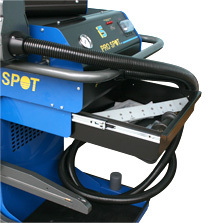 The operator can chose between two different modes AUTO and MANUAL for the two sided spot welding. Based on the thickness and resistance feedback information the i5 automatically delivers the correct weld power every time regardless of type of metal, thickness or corrosion protection between the metals. 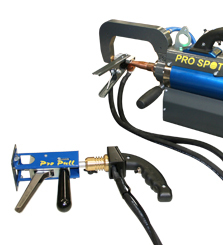 Pro Spot’s signature Spot Gun features double-acting cylinder, wide-spreading, self-aligning electrodes. The i5 features a 5 gal. (20L) radiator looped cooling system all the way to the weld caps. The X-type design is used on certain applications where the C-type can’t reach. 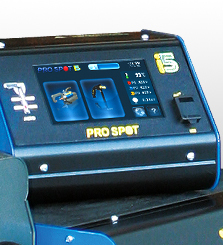 An all new interface that is intuitive and easy to read thanks to the high resolution full color display, and powered by software designed by professional programmers, engineers, and welders. Designed with convenience and practicality in mind. A drawer under the front panel can be used to store smaller accessories. Under storage for the larger accessories such as weld arms and cable. Quick change between 2-sided and 1-sided welding. Comes with several single sided programs. At the press of a button the i5 measures the thickness of the metals automatically using the latest optical technology. The i5 then senses the metals to be welded from a pre-delivered current to determine the type of metal. The i5 features a new medium frequency trans-gun capable of delivering over 13,000A with over 1,000 lbs (450 daN) of squeeze pressure. Based on the thickness and resistance feedback information the i5 delivers the correct weld power every time regardless of type of metal or thickness. Actual welds made with the i5 in Auto Mode. Notice the consistency of the weld nuggets and the heat affected zone. The welds stays very consistent welding 2 layers (2.4mm), 3 layers, 4 layers and 5 layers (6.0mm) as well as welding through boron steel. No weld settings were changed. The i5 automatically adjusted to the correct settings. Smart, very smart. 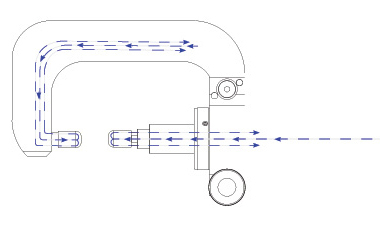 One of the most important features of the spot gun is its "double-acting" ability. Unlike any other trans-gun on the market the i5 can spread the electrodes wide open with the push of a button without the operator ever having to remove his or her hands from their original positions. 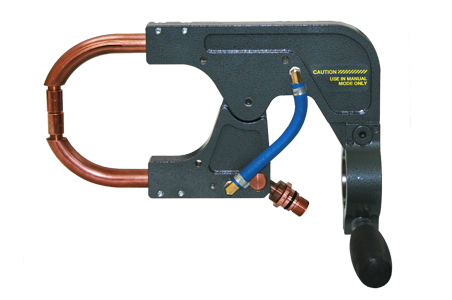 That not only saves time but also assures that the operator doesn’t to have to alter their holding position in order to loosen and move the weld arm manually only to then re-tighten. 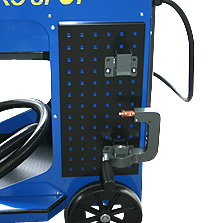 ( with weld data and repair recommendations ) from several manufactures. The coolant circulates through the radiator, and all the way to the tips in the i5's all new liquid cooled weld arms. The X-type design is used on certain applications where the C-type can’t reach. 90% of all welding needs can be done with the C-type but for some radiator support and truck bed pinch welds, the X-adapter is priceless. 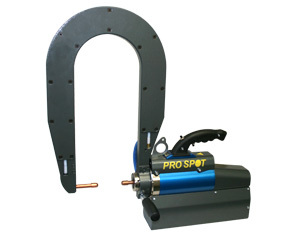 This invention from Pro Spot now makes it possible to weld where you never could before! No assembly needed. No cables needed. The current is transferred via a pivoting copper conductor which also allows for the build up of squeeze pressure. The C to X Adapter had to be completely re-designed from the ground up to make the best use of the i5's ultra high squeeze pressure capability and water cooled features. The i5's screen housing can swivel a full 270°, and while we've gone digital we still include a physical power switch and pressure guage for convenience. In the rear of the i5 you can locate the cooling fans, coolant tank cap and level indicator, plus the power cord and air inlet. This is also where the overhead boom rests. A hidden drawer has been installed to place everyday items that a welder might need to keep at hand such as extra tips, or single sided welding bits. The i5 has tool racks installed on both sides and places for all of the extension arms that come standard with the machine. There are also upper and lower trays to lay tools on within reach. and 1-sided welding. i5 is pre-programmed with 60 Single-Sided programs. cooled to the weld caps. 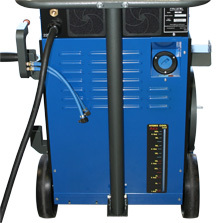 Auto Weld: The i5 delivers the correct weld current, weld time, and weld pressure every weld regardless of type of metal or thickness at the push of a button. Double Acting Trans Gun: Unlike any other trans-gun on the market the i5 can spread the electrodes wide open with the push of a button without the operator ever having to remove his or her hands from their original positions. Full Color Touch Screen Interface: High contrast full color touch screen display featuring over 3,000 OEM screens (with weld data and repair recommendations) from several manufactures. 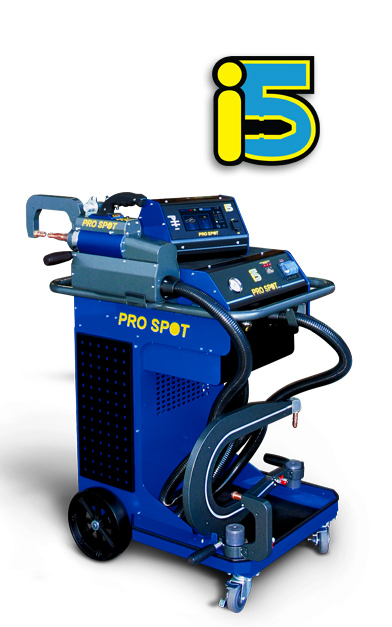 Custom Water Cooled Weld Arms: The same versatility and ease of use that Pro Spot has made a standard in the industry, but with the added functionality of a 5 gal. (20L) radiator looped cooling system all the way to the weld caps. Advanced Upgrade System: Upgrade your systems software via the same USB slot that you receive log-in and weld history info. No flash cards required. Information on a specific product? Go to the Request Form. Technical problems? Contact the Webmaster about this page. This page last updated on Tuesday, March 07, 2017 08:55 AM.